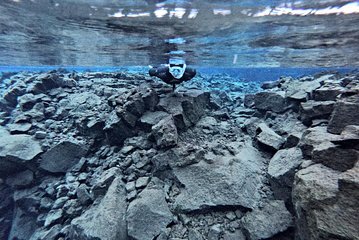 Snorkel between the American and European continental plates in a fissure that cuts through Iceland’s Thingvellir UNESCO World Heritage Site. One of the top dive sites in the world, the crystal clear waters of the Silfra fissure remain 35–39°F (2– 4°C) year-round and provide more than 328 feet (100 meters) of visibility. Explore the site with a small group and 9mm wetsuit for a personalized and comfortable experience.